I did this a while ago but when I was searching for it last night I could only find a tag version, so I want this in its own post to direct people to when they want true bypass and LED indication with a DPDT stomp. This also works fine with a 2N7000 mosfet but it will need rotating 180°. And bloody marvellous it is too, works a treat! Milikit, does it take a second for the LED to fully light up when engaged? I'm not too sure sorry Adam, but I can't say that any of mine have taken a second to illuminate. If the effect engages as desired, I wouldn't worry too much about it mate. I use 2N7000 instead of the listed & it works fine, but if I remember correctly, it will need to be rotated 180. Not too sure about the diode though as I have a wee stock of 1N914, so I've always used those for this utility. Try it & see would be my best advice dude. 1N4148 can be used instead of 1N914, 2N7000 instead of BS170. These alternatives are both cheaper at Tayda at least. Thanks for posting this Ivlark. Yes it's just another option. When I first did the millennium bypass layout I could buy the stomp switches locally for about £1 each and at that time you were paying about £4 each for the 3PDT stomps. Now it's not as much of an issue because the 3PDT stomps have come down in price so much, but I still get asked from time to time if it is possible to have true bypass switching and LED indication with a DPDT stomp, and this is for those occasions. Some people do seem to be able to get the DPDT stomps cheaper and more easily locally. Aren't the "latching" DPDT switches that you can use for this also the ones that don't have the loud CLICK when you engage the switch? Having never ordered one or used this method, I'm not sure. But I think that that is what is used on my Lovepedal Pickle Vibe ( I know - I bought it before I started building 3 years ago... it really is a great sounding vibe though ) - there is no loud click when engaging the stomp switch. Is that correct? The lovepedal pickle vibe comes with a relay or a soft switch (electromechanical switch). This is more expensive than either 2pdt of 3pdt. As Mark says, when you had to pay 10 euro for a 3PDT switch and just 3 for a dpdt, the millenium was really a cool solution to save some money. Right now is not very useful as 3PDT switches are dirty cheap, but you can always find an use, for example in small DPDT toggle switches if you want to get an indicator for this part of the circuit. I think this will go inside my wah wah with the carling DPDT - perfect! I was just wondering what I was going to do with a few DPDT switches I had lying around... well there we go! Sweeet! The 3pdt switches are still pretty expensive.. I only just recently started building, I had no idea they were even more expensive before! I've built 2 and on both the LED just stays on. The switch doesn't do anything.. Any advice? I assume you haven't connected it to an effect yet? 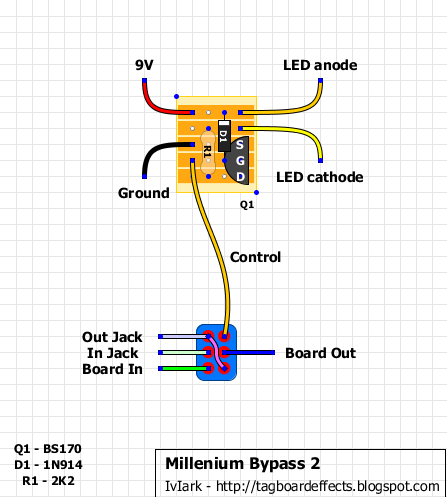 Basically millennium bypass won't work unless it's connected to an effect because it needs the effect's output resistance to switch the LED off. Connect it up to an effect and it will work fine. Yeah that's exactly the case.. Ha. Thanks! is any option when the dpdt is used to select between 2 effect to have an option with 2 millennium bypass to have 2 lights in one position the one and in the other the other ? here is the way i've wired all the things... the draw it's kind of messy so in/out tips and led are not drawed to not mess it more. for the millenium i used a BS170 and a 1n4148 as diode. Hi Alexis. Well your wiring for the millennium bypass board looks fine to me, but you're over complicating things by building it up complete and then testing. When you do that you sometimes have to sort out multiple problems and it makes it more difficult to diagnose. I'd strongly recommend disconnecting the bypass and getting the effect working first, maybe just using a terminal block to attach the input and output wires temporarily to the input and output sockets to test. Once that is sorted you can then move on to the bypass switching. The main issue is that if something is wrong with the effect side, then it could mean that the millennium bypass won't work even if it is built perfectly, and so we need to do this in stages to make sure you minimise the number of possible areas that could be causing a problem. One issue that does come up sometimes with any circuit using mosfets is that they're very susceptible to static electricity which can damage them quite easily. So it may be worth swapping the BS170 and seeing if that changes anything, but I'd really recommend sorting out the effect before even worrying about the bypass board. Well, the effect is now working. i've wired board in/out to in/out connectors and all is working. Ah, and the led seems to act like a slave of the guitar sound (more guitar signal the more the led turns off). weird. oh, sorry. "latching"? I don't understand that word. During bypass the board output is connected to the gate of the mosfet, and it's the resistance on the gate which turns the LED off. If the LED is staying on and assuming the board is built correctly, then either the mosfet isn't seeing the resistance, maybe if you made an incorrect connection or you have a bad solder joint, or otherwise the mosfet may be damaged. They are very susceptible to static and so it isn't unusual for them to die. Thanks a lot for answering. I'll try another mosfet, maybe it's really damaged. I didn't knew about that. Mark, you're the best! It was the transistor. Now it's working good. Thanks very much! Hi Mark. This is working for me but the LED lights up very slowly once the effect is engaged. Any solutions? Ok check that, it's happening again. Was fine for about a day and then it started lighting up slowly again.. Help?? I'm having the same problem with a M2 board. The damn LED just stays on. I switch the effect off and the LED goes out, then fades back on again. I tried switching anotherBS170 to no avail and then a 2N7000 (rotated of course) but the LED stays on. Are you testing on its own or have you got it attached to an effect? I'm having the same problem as Muad'zin. I've got it attached to the 360 Bass Fuzz. At first, I wired the 360 Bass Fuzz in true bypass but there were a "pop" when switching on. So, I tried the millenium (with a 3PDT) to solve the problem... Now there's no "pop" but the LED is always on. I tried many transistors (BS170, 2N7000, SK117...) and the problem is still there. I'm building the JCM800 Emulation circuit with my HighLow mod (which I'm putting on a second footswitch), and I wanted some way to show which input is selected. I don't want that LED to switch on and off, just change between green and red (I'm using a tri-color LED with the blue anode disconnected). R1, is that also the current limmiting resistor for the LED? that thig works! but need to be careful with transistor while soldering - heat kills it pretty quickly. worked like a charm! and its fast and responsive. Thanks so much!! !